Farmers of Salem’s service line coverage provides protection from an unexpected loss caused by a service line failure. This sometimes unforeseen and costly exposure is not covered under most homeowners insurance policies, and most homeowners do not realize they are responsible for the underground service lines from the street to their home. This product protects the homeowner by extending coverage for damage to underground piping, wiring, valves, or attached devices that connect a home to a public utility service provider or to a private system. Damage to your underground service line that is the result of a service line failure. 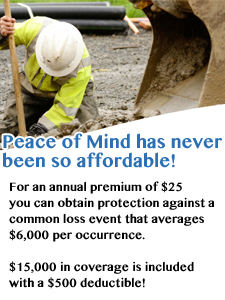 Costs required to repair or replace the damaged covered service line that is the result of a service line failure. Your outdoor property that is damaged as a result of a service line failure or that is damaged during the excavation of your covered service line following a service line failure. Additional living expense and rental value. A tree root grew through a sewer pipe located on the homeowner’s premise causing it to leak. The sewer line was 200’ long and required a backhoe to dig up the damaged piping and replace it. The cost to replace the sewer line was $1,750 and the excavation cost totaled $4,050.